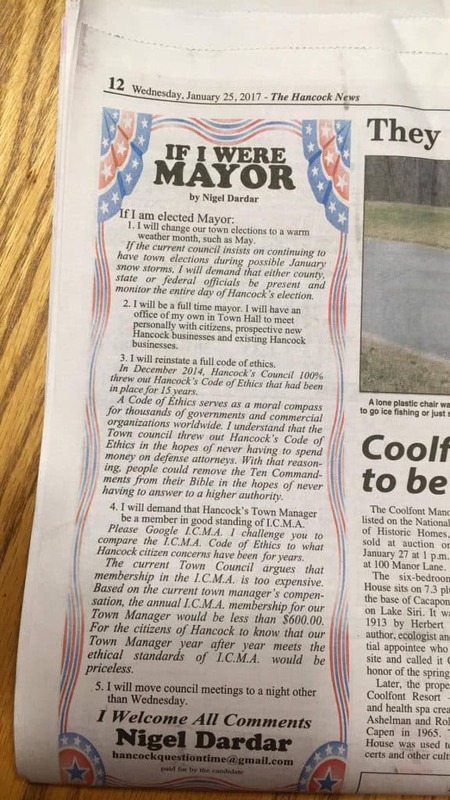 If elected mayor of Hancock, Nigel Dardar would demand that federal, state and county officials be on scene to monitor “the entire day of Hancock’s election” if the “current council insists on continuing to have town elections during the month of January,” according to a newspaper ad Dardar purchased in The Hancock News, Hancock’s local newspaper. Dardar suggests moving town elections to a warmer month – perhaps May, when the threat of a winter snowstorm would be significantly diminished. Federal, state and even county authorities have no jurisdiction over Hancock’s town elections.